We’re pleased to introduce Rx Pulse — a quarterly newsletter designed to keep our broker partners and clients informed of the latest pharma trends and the opportunities to better manage pharmacy benefits. We hope you’ll take a moment to give us your feedback. Have suggestions on topics for future newsletters? We’d like to hear them! Contact us at info@yourrxsolutions.com. Seniors enter the Medicare coverage gap — requiring them to pay for a bigger share of their drug costs — once spending for their medications exceeds $3,820 in a year. Fewer people would also reach the “catastrophic phase,” once out-of-pocket drug spending exceeds $5,100, at which point the federal government picks up much of the bill. Seniors must still pay 5 percent of a drug’s cost, but that too would be based on the lower net price. The Trump administration says that a lot will depend on how companies react. If the plan takes effect next year, it could cost the government an extra $2.8 billion to $13.5 billion that same year. Many companies are already introducing plans that allow employees to share in some, if not all, of the discounts when they go to the pharmacy counter. About a quarter of large employers expect to have a program like that this year, according to the National Business Group on Health, which represents large employers, and the largest pharmacy benefit managers are already working with large companies to pass on savings. In a speech last week, Alex M. Azar II, the health and human services secretary, pointed to the story of a woman named Sue, whose annual income was $24,000 a year and who could not afford the $7,200 a year in out-of-pocket costs for a drug to treat a genetic skin condition. Sue’s out-of-pocket costs would fall, but perhaps not enough to make a difference in her budget: After a 33 percent discount, her out-of-pocket costs would still be $5,544 per year. This year, Washington state is averaging more than one new measles case a day as officials try to stop the disease's spread. Since January 1, Clark County Public Health has confirmed 49 cases of measles. In King County, home of Seattle, at least one confirmed case was reported. A vast majority of those who came down with measles – 41 – were not vaccinated against the disease, Clark County officials said. One patient received a vaccination against MMR (measles, mumps and rubella), but the health agency declined to provide more details on that case "to protect the patient's privacy." Most of the Washingtonians affected – 34 – are children between the ages of one and 10. "Clark County Public Health is urging anyone who has been exposed at an identified location and believes they have symptoms of measles to call their health care provider prior to visiting the medical office to make a plan that avoids exposing others in the waiting room," the agency said. 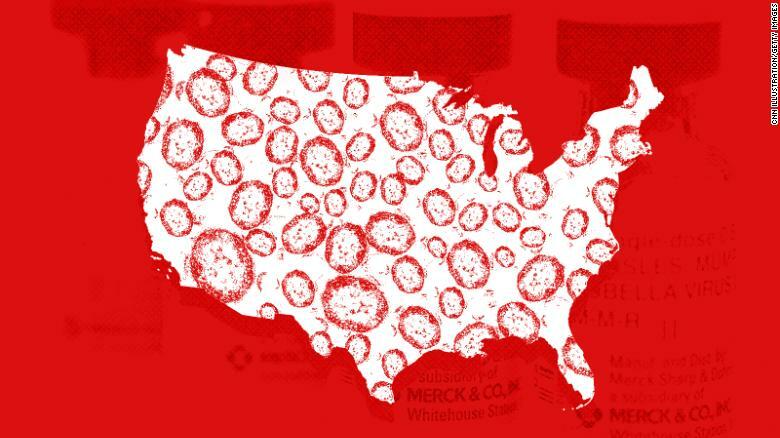 Washington isn't the only state grappling with the disease. Officials in Harris County, Texas, which includes Houston, reported three cases of measles Monday, bringing the total number of cases in the state this year to six. Two other outbreaks have also been reported this year, the CDC said, in New York state and New York City. Health officials have said those outbreaks are within observant Jewish communities. According to the New York State Department of Health, at least 209 cases have been reported there since October: 64 in Brooklyn and 145 in Orange and Rockland counties as of last week. The outbreaks began when travelers to Israel and Ukraine returned with the illness. There are large measles outbreaks ongoing in both of those countries. "In a given year, more measles cases can occur for any of the following reasons: an increase in the number of travelers who get measles abroad and bring it into the U.S. and/or further spread of measles in U.S. communities with pockets of unvaccinated people," the CDC website says. The measles vaccine – known as the MMR vaccine – is very effective. One dose is about 93% effective at preventing measles if you come in contact with the virus. Two doses are about 97% effective. Experts recommend that children receive the vaccine in two doses: the first between the ages of 12 months and 15 months and the second between four and six years old. In the 2018 fiscal year, the Food and Drug Administration set a record by approving and tentatively approving 971 generic drugs, including a record-breaking month with 110 generic drug approvals in October. This eclipses the previous record set in 2017 of 937 approvals. and 835 in 2016, both also the highest in their turn. There are several new generic product offerings to the marketplace, including drugs for multiple sclerosis, attention deficit disorder and erectile dysfunction. Not every new drug that emerges from the FDA approval process becomes a big seller. In fact, most do not. But some new agents are better bets than others. To keep you apprised of prescription drugs that may hit your bottom line, here are five new and potentially expensive treatments that could make a big financial impact in 2019 and beyond. Duchenne Muscular Dystrophy (DMD) is a devastating and incurable muscle-wasting disease, associated with specific errors in the gene that codes for dystrophin, a protein that plays a key structural role in muscle fiber function. DMD is always fatal, usually before age 30, and generally due to respiratory or cardiac failure. If approved, Golodirsen will offer a new treatment option for DMD patients with a certain genetic makeup. While an existing medication in the class, Exondys-51™, works on the 13% of DMD patients who have a mutation on an area of the Duchenne gene known as exon 51™<, Golodirsen instead targets the 8% of DMD patients who have a mutation on exon 531. As with Exondys-51, expect Golodirsen to be costly. Sarepta Therapeutics Inc., which makes both drugs, charges approximately $300,000 per year for the average patient using Exondys-512. Most people with the most common form of multiple sclerosis, relapsing-remitting MS (RRMS), go on to develop secondary progressive multiple sclerosis (SPMS) after 10 to 25 years since disease onset3. SPMS is a form of MS that leads to progressive, irreversible disability, such as the need for enhanced walking aids and wheelchairs, bladder dysfunction and cognitive decline. Researchers have long sought a drug to delay onset of SPMS. Novartis Pharmaceuticals claims that siponimod is the first investigational medicine to show a significant delay in disability progression in typical SPMS patients. If approved, siponimod would be the first oral disease-modifying therapy for SPMS patients4. Paroxysmal nocturnal hemoglobinuria (PNH) is a condition that leads to early destruction of red blood cells. The disease also impairs disease fighting white blood cells as well as blood-clotting platelets.10 PNH can cause a wide range of debilitating symptoms and complications, including thrombosis, which can occur throughout the body, and result in organ damage and premature death. Sarepta Therapeutics. “Exon-Skipping for Duchenne.” Accessed at: https://www.sarepta.com/pipeline/exon-skipping-duchenne. Stat News. “Sarepta to charge $300K for Duchenne drug.” Accessed at: https://www.statnews.com/pharmalot/2016/09/19/sarepta-duchenne-drug-prices/. National Multiple Sclerosis Society. “Secondary progressive multiple sclerosis.” Accessed at: https://www.nationalmssociety.org/What-is-MS/Types-of-MS/Secondary-progressive-MS.
Lancet. “Siponimod versus placebo in secondary progressive multiple sclerosis (EXPAND): a double-blind, randomised, phase 3 study.” Accessed at: https://www.ncbi.nlm.nih.gov/pubmed/29576505. Current Diabetes Reports. “A Review of Adolescent Adherence in Type 1 Diabetes and the Untapped Potential of Diabetes Providers to Improve Outcomes.” Accessed at: https://www.ncbi.nlm.nih.gov/pmc/articles/PMC4692366/#. Pharmaceutical Technology. “Lexicon/Sanofi’s Zynquista divides experts on FDA approval prospects in T1D.” Accessed at: https://www.pharmaceutical-technology.com/comment/lexicon-sanofis-zynquista-divides-experts-fda-approval-prospects-t1d/. IQVIA Institute. “Medicine Use and Spending in the U.S.” Accessed at: https://www.iqvia.com/institute/reports/medicine-use-and-spending-in-the-us-review-of-2017-outlook-to-2022. New England Journal of Medicine. “Risankizumab versus Ustekinumab for Moderate-to-Severe Plaque Psoriasis.” Accessed at: https://www.nejm.org/doi/full/10.1056/NEJMoa1607017. Lancet. “Risankizumab in patients with moderate to severe Crohn's disease: an open-label extension study.” Accessed at: https://www.thelancet.com/journals/langas/article/PIIS2468-1253(18)30233-4/fulltext. Genetics Home Reference. “Paroxysmal nocturnal hemoglobinuria.” Accessed at: https://ghr.nlm.nih.gov/condition/paroxysmal-nocturnal-hemoglobinuria. Blood Advances. “Ravulizumab (ALXN1210) in patients with paroxysmal nocturnal hemoglobinuria: results of 2 phase 1b/2 studies.” Accessed at: https://www.ncbi.nlm.nih.gov/pmc/articles/PMC6134221/. Clinicians from three Kaiser Permanente divisions have advice for healthcare providers who want their patients to accept and succeed with treatment plans that reduce the use of opioids for the alleviation of chronic pain. “Be empathetic,” said Quan Nguyen, Assistant Area Medical Director for Kaiser Permanente of Orange County, Calif., during the Tuesday morning session Focus on Triple Aim Objectives: A Population Health Approach to Opioid Use Improvement, presented during the 53rd ASHP Midyear Clinical Meeting in Anaheim, Calif.
Nguyen described the AIDET (Acknowledge, Introduce, Decision, Explain Treatment) approach as one that has succeeded for his organization. “Acknowledge that the person has pain,” Nguyen said. He said this is an important first step for clinicians, because their patients are anxious and want caregivers to believe that the pain is real and the healthcare provider wants to help. He said clinicians next need to introduce to patients the fact that past practices for the treatment of chronic pain have caused harm, including death from opioid overdoses. New, safer treatment recommendations place much less emphasis on opioids and more on nonopioid and nonpharmacologic methods of pain control, but patients may be unsettled by those changes. He said the “Decision” part of the AIDET approach is an opportunity for clinicians to say that they no longer prescribe the medications or dosages that patients have received in the past. When speaking with patients, Nguyen said, clinicians can explain that the decision is based on evidence, clinical experience, and national prescribing recommendations, and is meant to make therapy safer. He said empathy is particularly important in the final part of the approach, in which the clinician explains the new treatment recommendations and works with the patient to personalize the treatment plan. He said patients may need to be reassured that the changes will be implemented gradually, and the care team will support the patient throughout the process. Elizabeth D. Bentley, Director of Clinical Pharmacy Services for Kaiser Permanente Northwest, said the organization uses a population-based approach to identify patients to target for opioid reduction efforts. She said about 5 percent of the integrated health plan’s patients who seek treatment for pain have complex medical conditions and high healthcare costs and are most likely to have poor outcomes from opioid use. At the bottom end of the risk profile are the 60–80 percent of patients with easily managed pain and one or more concomitant minor conditions. The remainder are “rising-risk patients,” she said. This population consists of patients with uncontrolled conditions in addition to pain who haven’t yet reached the high-risk category but could do so without intervention. “That’s where the opportunity really is to make a difference,” Bentley said. She said pharmacists have many opportunities at Kaiser Permanente to help these patients, such as by monitoring drug therapy, working with patients as they taper off opioid therapy, and providing academic detailing services to clinicians. She said targeted interventions have led to large reductions, sustained over time, in morphine milligram equivalent dosages prescribed to patients in the northwest division, and Kaiser overall has seen reductions in high-dosage opioid prescribing across the organization. William D. Gersch, Clinical Pharmacy Specialist in pain management for Kaiser Permanente Colorado, said his division uses a stepped approach to improve opioid prescribing without a large outlay of staff resources. Gersch said long-term users of opioids are classified as being at low, medium, or high risk for overdose. Factors such as the patient’s substance abuse and psychiatric history, opioid dosage, and concomitant use of benzodiazepines and hypnotics are included in the risk assessment. He said the low-risk population is monitored passively with the aid of a Kaiser-developed registry of opioid use and related factors, identification of gaps in care, and education of the healthcare team about appropriate opioid prescribing and use. Gersch said clinicians who care for medium-risk patients receive about two months of “pain e-consult” services from pharmacists and physicians who specialize in pain management. Additional support, such as shadowing the specialists and participating in monthly meetings to share struggles and best practices, are also provided to these clinicians. Kaiser has determined that the pain e-consults save the health system about $7,770 in healthcare costs per patient annually. The National Prescription Drug Take Back Day is April 27, 2019. It addresses a crucial public safety and public health issue. According to the 2016 National Survey on Drug Use and Health, 6.2 million Americans misused controlled prescription drugs. The study shows that a majority of abused prescription drugs were obtained from family and friends, often from the home medicine cabinet. Visit the DEA Take Back Day website to locate authorized collection sites for disposal on April 27 and year round using the Collection Site Locator. This material was created by NFP Corp. (NFP), its subsidiaries or affiliates for distribution by their agents, registered representatives or investment advisor representatives. This material was created to provide accurate and reliable information on the subjects covered but should not be regarded as a complete analysis of these subjects. It is not intended to provide specific legal, tax or other professional advice. Neither NFP, its subsidiaries or affiliates offer legal or tax advice. The services of an appropriate professional should be sought regarding your individual situation. Insurance services provided through licensed subsidiaries or affiliates of NFP. To locate an NFP office, please go to nfp.com. 9/18 (18-FCB-EMBN-GEN-0520) Copyright © 2018 NFP. All rights reserved.